After pilfering the band’s vehicle in 1983, the man in charge of the 4-strings, a reprobate by the name of Roger Rogerson, disappeared into the ether. Almost fifteen years after his disappearance, he emerged with the demand for a reunion of the Circle Jerks in a bid to become the biggest rock’n roll band on earth. Shortly after, he died. Despite being one of the original members of the seminal band, his shenanigans were never properly documented. 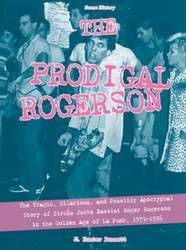 In a compelling narrative based on conversations with contemporary witnesses, with never-before-published photos of the band, The Prodigal Rogerson sheds light on Roger Rogerson’s story and his persona, put into the context of one of the most fertile punk scenes of the early 1980s. Growing up in Europe one imagined that NYC was where the wild things were, not unlike the compilation of the same name suggested, and that the West Coast was laid-back and easy going. Visits during my formative years and eye witness reports of scenesters proved that the place that spawned melodic punk rock, was in its hey days a hotbed for violence, mayhem and all kinds of craziness. Bennett uses interviews Rogerson’s family, ex-bandmates, companions, record label owners, journalists, managers and other contemporaries as a foundation and puts it into context or comments on the life and times of Roger Rogerson, who led a strange and varied life. Part comedy, part tragedy, it is a fast paced read and you find yourself intrigued, shaking your head or utterly amused by the shenanigans of the main protagonist. Posted Nov. 27, 2017, 7:16 p.m.